HOW WAS BERENGRAVE LANE SO NAMED? I am fortunate in having some of the notes of the late Mr W.J. Smith, and Mr Stuart L. Jelley who both wrote about the history of Rainham. The former will be remembered by older residents as Headteacher of the Council School in Solomon Road who then took over the new Senior Boys’ School in Orchard Street when it opened in 1933. The latter was a proprietor of a large outfitters shop on the corner of Pudding Road, now the restaurant, whose father Edwin Jelley with Marshall Harvey developed that area of Rainham Mark which bears their names. In one of Mr Smith’s writings he explained the origin of various place names including Berengrave which he said took its name from the ‘Berens’ family who were well known in Kent. I had no reason to doubt its accuracy until I recently examined a map dated 1801. This was fairly small scale and the roads were not named but the one which continued to the river directly opposite to the one leading to Bredhurst and Wigmore showed a ‘Burying Grave’ about a quarter of the way down the lane and the words spanned both sides of the road. I emphasise that this was small scale but the wording is just south of a ‘link’ to a road which I take to Bloors Lane and presume to be the present pathway. The rather unusual description may or may not have significance because Roman burial grounds are marked on later maps as ‘Roman Cemeteries’ as is the one just east of the road to Motney Hill where many valuable articles were found, some of which are said to be in Eastgate Museum, Rochester. This was distinctly separate from the seven Roman burial urns found on the Saltings to the north of Rainham Creek between Bartlett Creek and Nor Marsh in January 1881 which contained human remains. On the other hand, the Manor of Queencourt comprised some 485 acres of arable, pasture and marsh land, much of which was either side of Berengrave Lane, with a water mill beside Rainham Creek ‘at the end of a little lane to the east of Bloor’s Place’, probably now Motney Hill Road. There were about 36 acres in Upchurch and Lower Halstow. With the exception of ‘Berengrave House’ and 30 acres the rest of the property was sold by Mr ‘Squire’ Walter and his sisters to various purchasers in 1900. Berengrave Lane was known to many older residents as Walter’s Lane, and the Squire owned various other properties in Rainham, including The Parsonage. Going back into history the Manor was given by Queen Alianore (sometimes Eleanor) wife of Henry III to the Master and Brethren of St Katharine’s Hospital in 1273. This was to re-establish a charity to support six poor bachelors and six poor spinsters. I do not know if the institution still exists but last century its title was The Royal Hospital and Collegiate Church of St Catherine providing schools for boys and girls, a guild for past scholars, and a chapter consisting of a master, three brothers and three sisters. 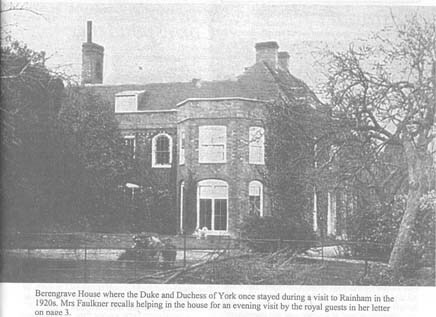 The Queen’s nurses had a house and offices there. I’ve strayed somewhat from the origin of the name of ‘Berengrave’ but I have tried to show that this was a very important area somewhat independent of the village, although only four houses are shown as built in the lane up to 1901, a lot of workers must have been employed. The population of Rainham in 1801 was 722. On the other hand I did wonder if a ‘Burying Grave’ might have been placed remote from the village when residents were afraid of infection during the Plague. This seems unlikely in such close proximity to the Manor House but perhaps others may cast light on the subject. So many place names have been corrupted over the years that I can quite easily see how ‘Burying Grave Lane’ became ‘Berengrave’ but I’m afraid that readers must decide! The present Berengrave Lane is very different from that which I frequented as a young boy in the early 1920s. It was then a very eerie road at night with no pavements, the wind howling through high overgrowing trees and only three single mantle gas lamps from the top down to the railway line. If you reached Berengrave House you’d hear footsteps on crackling brittle dead holly leaves and then suddenly the old donkey would start braying which made an already nervous youngster take off. There was also the popular legend about the headless horseman who galloped down the lane at midnight. If I had known that there was also a Burying Grave lower down I’d have been petrified! P.S. I have been reminded that some older readers consider that the main house in the Lane should be spelt Berengrove and not Berengrave, so I consulted Mr Peter Sargent at the Map Shop who, having checked with the Ordnance Survey Agency, found that the five maps issued between 1878 and 1933 showed the residence spelt with an ‘a’ but those issued in 1938 and 1959 (just before it was demolished) had an ‘o’. The current map shows the Council ‘plant area’ off Bloor’s Lane as Berengrove Nursery. Cozenton Farm, which was next door to Berengrove? House, was described as Corzenton on the Deeds in 1888 whereas the map of 1891 shows it as Cozenton. There is an area at the bottom of Blue Bell Hill called Cossington which probably had the same origin. Many roads and place names have been changed over the years, even the village itself has apparently been Rygingaham, Raegingaham, Raenham, Raynham, Reinham, and Renham before getting to Rainham. Hi,does anyone know who was living in Berengrave house in 1939.According to my records my parents were working there.in 1939.but I have been unable to get any information from the family.Can you help please. You have spelt Jelly wrong! My gt-grandfather and grandfather spelt their names as Jelly with no second "e"